This new villa is spotless, and has every conceivable amenity. Aya has gorgeous views from L’Estang all the way to St. Jean Bay, which are only more beautiful at night. Only a short walk to the beach, this villa is beautiful and convenient. 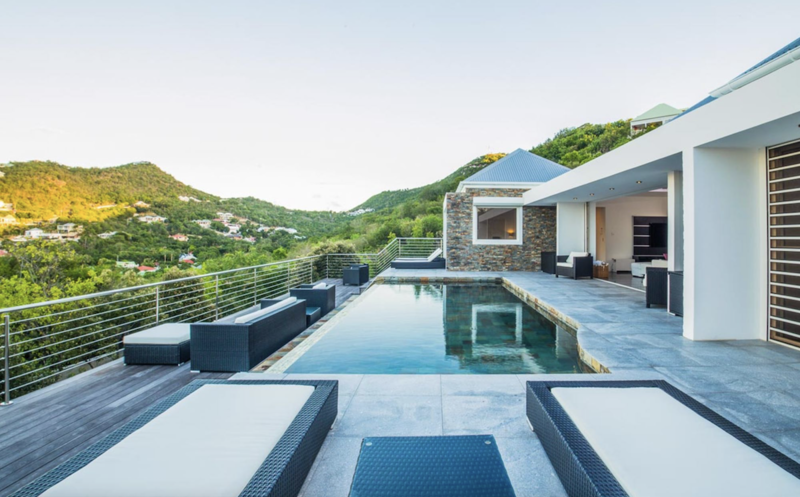 Aya Villa is tucked in the hills of St. Jean just a short walk from the beach and minutes away from town. Views of the ocean and the countryside are sure to please. The open floor plan forms a “great room” which holds the living room, dining room, and well-equipped kitchen. Fully air-conditioned, the great room opens to the pool terrace and has minimal decor to avoid distraction from the all-encompassing St. Jean view. The indoor dining area seats four, and the outdoor dining area under the gazebo seats eight. Each bedroom features a king-sized bed, ensuite bath, U.S. satellite TV, and private decks on either side of the pool. The solar-heated pool keeps the water temperate year-round, and a lawn on the side of the villa has seating and BBQ perfect for relaxing and entertaining. Short drive to St. Jean beach or approximately a 10 - 12 minute walk along a level road.